The Technical Library sub forum will contain how-to and reference articles for all generations of the FJR1300. 13.B - For tech library threads, same approach as the merchandise threads – all posts will be related to the tech library topic – questions about the topic, posts adding to the topic from a technical perspective, etc. Any posts outside of those will be deleted by forum moderators or admins. The ABS Test Harnesses I posted about some time ago, are now available. Product Description : Wire harness is approx. 400 mm/ 16 in. long and includes a switch. Harness can be installed on the bike for convenient access under the battery cover, or used standalone to cycle the ABS during brake flush and bleed. Instruction sheet will be made available for download that includes photos of a typical install. This is a simple harness that allows you to cycle the ABS pump on any ABS equipped FJR, which you should do during brake fluid flush and bleed maintenance. For simplicity, it does not have the two pigtails like the OEM harness (for multimeter readings). ABS Test Harness can be purchased here - cost is $7 + $5 flat rate shipping. Instructions are available in a downloadable PDF as well - add this to your cart before checkout to get the download link (it's free). US orders can be placed at the above link. Price is U$7 plus $5 shipping by USPS, payment by Paypal. Shipping will be combined if also ordering the ABS test harness. Note - If you are Canadian (Billing Address) and have a US Shipping Address, we're working on making that functional. Price as above. Canadian (or other) orders with a non-US Shipping Address must be placed manually. Price is C$27 plus ~$15 shipping by Canada Post to Canadian addresses (may be less, clarifying with CP). Send me a PM with your email address for further info and delivery options. If you can combine an order with a local buddy, that may save shipping. Instruction sheets also available by email. Last edited by raYzerman on Mon Feb 11, 2019 9:51 am, edited 2 times in total. To help you understand why it is recommended to cycle the ABS system when you perform a brake fluid flush and bleed, this is a brief overview of the ABS system. Refer to the Yamaha Service Manual, General Information for more complete description of the ABS system’s operation. The following is a Gen 1&2 ABS Block Diagram up to 2007 (North America). In 2008, the ABS system was improved, and further changes were made for Gen 3 2013 onwards, but essentially the fluid paths are functionally similar. In normal braking without ABS, the fluid is passed through the ABS system, bypassing the ABS fluid circuits between points 5, 6 and 7. Fluid here becomes stagnant, and if dried up, can become like a blood clot in an artery if ABS is not activated. Subsequent ABS activation may not allow fluid to pass through these circuits, or can migrate downstream potentially causing blockages in the proportioning valve (8), metering valve (11) or in the lines, preventing proper fluid flow. Regular flushing and bleeding, along with ABS activation with the test harness will put fresh fluid in all the circuits. 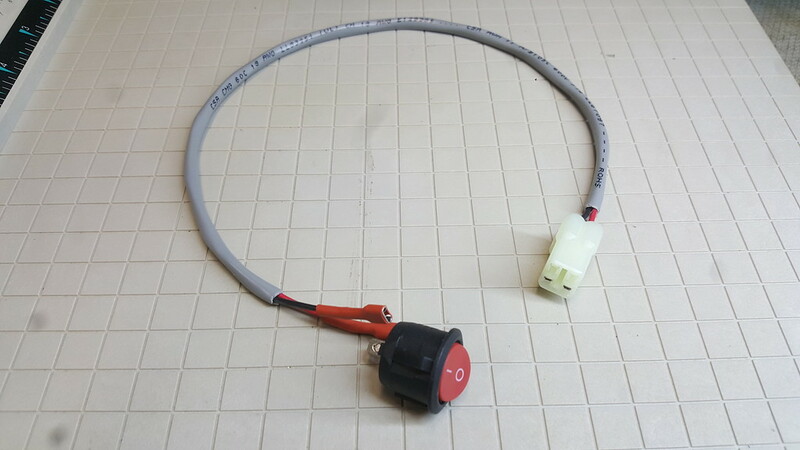 This test harness can be installed and left on the bike for convenience to cycle the ABS system when flushing and bleeding the brake fluids, or optionally removed after the test. The following instructions are for a permanent install. For additional reading, refer to the General Information section of the Yamaha Service Manual for ABS system operation, and the information following these instructions. 1. 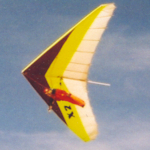 Remove instrument panel cover on Gen 3, battery cover, or if Gen 1&2, right side IP cover. 2. Locate ABS test connector in near the Red+ battery connection. Insert a thin blade in between metal stay and middle rib on connector to unlock it, then pull rearward to release. 3. Remove dummy connector with 4 black waterproof plugs, then with a pin or wire, push out two of the black waterproofing plugs. Insert the two plugs into the two open ports on the test harness connector. 4. 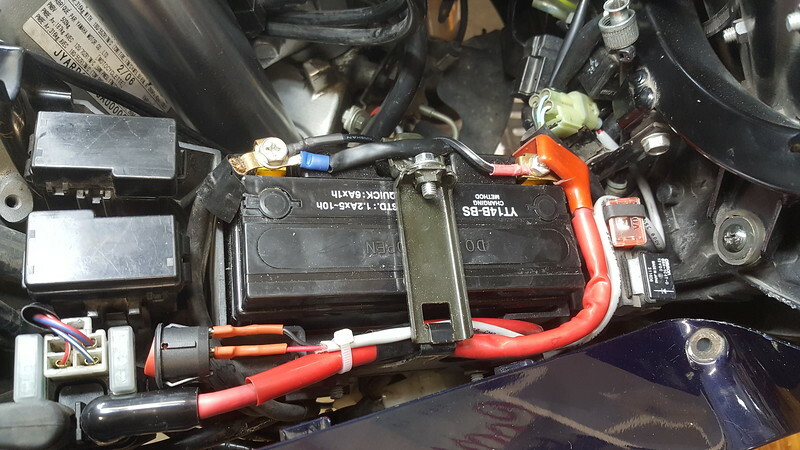 Route test harness wire forward and loop around the outboard side of the battery, avoiding anything sharp that may abrade or damage the harness over time. Plug in to bike’s ABS connector and re-install on the metal stay, adjust wire routing as necessary. 5. Find an appropriate location for the test switch and connect switch (polarity unimportant). Suggest near/beside the bikes fuse panel where it won’t get accidentally switched on, use a wire tie to hold the harness/switch in place, adjust routing for any excess wire length. See photos for suggested routings. 6. After ABS test, turn Ignition OFF and ensure test harness Switch is in the OFF ‘O’ position, then replace instrument and battery covers. 7. 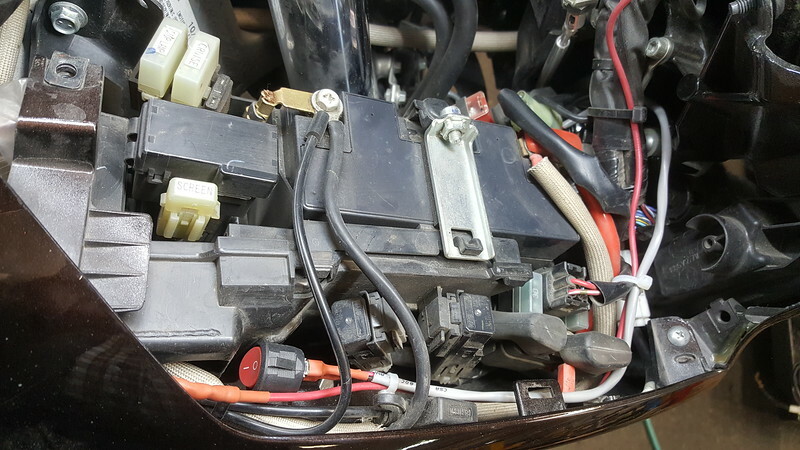 Optional, for a temporary use, unplug the test harness and replace the dummy connector. Ensure the battery voltage is >12.8 volts or the test may not work. When testing/cycling the ABS system, first flush and bleed the brake system normally until you have fresh clear fluid in the system. Then with Ignition OFF, turn test harness switch ON. Simultaneously, hold moderate pressure on rear brake pedal and front brake lever, and turn Ignition ON. ABS system will cycle (pulse) twice in rear brake and once in front brake. Recommend repeating the test. 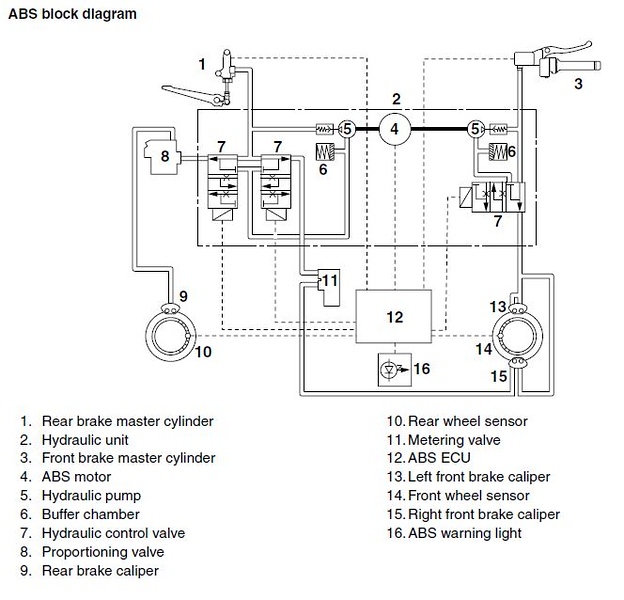 This sends fresh fluid into the ABS fluid circuits within the pump, which are normally unused/bypassed unless ABS has been activated (see ABS Block Diagram). Optional – To ensure old fluid has been pushed out of the ABS fluid circuits, on right front caliper, bleed a small amount (~tbsp) of fluid at upper bleeder (front brakes), then lower bleeder (rear brakes). Repeat ABS test cycle, then shut the test switch OFF and place it such that it won’t be accidentally switched on when the battery cover is re-installed. Recommend flush, bleed and ABS activation annually to prevent any dried up fluid from blocking the ABS fluid circuit. It is also recommended to flush and bleed the clutch annually. Last edited by raYzerman on Sat Feb 16, 2019 8:20 pm, edited 2 times in total. Reminder - similar to the FJRiders Merchandise threads, this is a no B.S. zone - any post not directly related to a question about this item, it's use, or purchase of it, will be deleted at the admin/ moderator's discretion. This is a procedure I wrote about the ABS system using a jumper and switch to activate the system. Ignore the jumper/switch since this is what Ray's harness does. Note that the two wires that end in spade connectors are for a multimeter to read out ABS codes. At the end of the test procedure I supply information on how to make a simple, permanent installation for the ABS test Coupler which makes this procedure easy to perform anytime. The following procedure is excerpted from a post I wrote in a different thread. This is the basic ABS and ABS Metering Block test procedure, pretty simple to do, just convoluted to read at first. As always, read and use your FSM for reference. You can verify that the ABS system is working, actuate the spool valves in the ABS hydraulic Metering Block and move a tiny amount of brake fluid by using the ABS test coupler. This is good for the health of the hydraulic unit and will help prevent freezing spool valves. The ABS test coupler lives under dash Panel D. On the Gen I the test connector has its own little bracket mounted to the frame holding it down and it has a cap over it, on the Gen II the test connector is above the battery. Please refer to your FSM for all the details. The following is intended to give you an idea of what is involved in a basic ABS Pass/Fail test. Congratulations, your ABS system works. Rotating the rear wheel when on the center stand may set Error Code 25 -- this is not an error or fault, disregard this error message. Because the front wheel was not moving while the rear wheel was turned by hand the ABS ECU thinks that the vehicle is moving but there were no pulses coming from the front wheel. The diagnostics for Code 25 specifically mentions that this will happen if the motorcycle is on the center stand and the rear wheel is rotated. 0.5 seconds later the front brake lever will pulse twice; then the rear brake pedal will pulse twice; after the brake pedal stops pulsing, 0.5 seconds later the bake lever will again start pulsating and continue for ~2 seconds. Congratulations, your ABS hydraulic system works. Connect the Test Coupler or activate the Test Switch you installed. Turn the key ON. Any recorded malfunction Codes will be displayed. Set the red Engine Run/Stop switch to OFF. Be SURE the Engine Stop Switch is OFF or Bad Things can happen. Push the Starter Button at least 10 times in 4 seconds to delete the Malfunction Code(s). Turn the key OFF. Done. By permanently installing the ABS Test Coupler and a test switch you won't have to jump wires or remove the Test Coupler. To test the ABS flip the switch ON (shorting the two switch contacts). Run the tests. Flip the test switch OFF (no connection between the switch contacts). Done. Edit on 2/28/2014 -- It is my understanding that ~ 1 year ago Yamaha stopped selling this test jumper to the public. You can still use an alligator clip lead or any other wire to jump the ABS connector pins and it will work just fine and save you a few bucks. Thank you, Alan, your detailed and excellent procedure is widely acclaimed, I've pointed many to it. I do want to comment on the original OEM test harness and clarify the difference with the one being offered for sale. It appears the intent for the OEM harness was for stand-alone use since it has the loop to bridge the two wires that set the ABS test in motion. The longer pigtails as you've pointed out are for multimeter readings. You have to remove this harness after the test so the ABS system will return to normal function. The harness being sold is intended to bridge the test wires with a switch instead of a wire loop, so it can be left on the bike if desired, and to keep it simple. It does not have the pigtails for multimeter readings, rightly or wrongly. However they can be easily added, but I've not had occasion to use them, nor wanted any risk of dangling loose connectors staying on the bike if left installed. There are diagnostic codes for wheel sensors and such in the normal DiAG screens 2015's and earlier. For those with 2016's and up, an OBD Code Reader and Adapter Harness are required. Nice work Ray! I look forward to acquiring one of these harnesses. Post 1 updated - ABS Test Harness is available for purchase in the FJRiders.com store - see link below. ABS Test Harness can be purchased here - cost is $7 + $5 flat rate shipping - U.S. only (Canadian and overseas orders please contact raYzerman via PM. Instructions are available in a downloadable PDF as well - add this to your cart before checkout to get the download link (it's free). URL not working. Went to the site, filled in everything, and it came back saying that each of the fields were required, even while showing all of the info that I put in, in every field. Never got to the PayPal screen. Happy to send you a USPS(postal) Money Order, or whatever works there. The unit does look good. Red - Pirelli Angel GT (Spec A) tires, TPMS, RDL seat, GPS digital speedometer (US$25.00). Unclick box to ship to other address, should be good then. Yeah, that worked. Still, I hate PayPal. US$19.00! Update - first wave of orders packaged, labeled, and ready for the Post Office. Thank you! Next segment of orders will be shipped Saturday morning (from Michigan) - thanks! I still hate PayPal! They managed to double my order, so what I bought was two units instead of one. I should know by now, gotta watch those guys! Oh well, no sweat. I can deal with it later. Just saw this - double checked, I already shipped the order, so I'm not able to correct it on my end, sorry. Bring it to a tech day or rally. Someone there will want to buy it from you. 3rd set of orders were shipped yesterday. I got mine. Thanks Wayne. Still haven’t figured out how to get the pdf, despite adding it to the cart and stuff. Bill - pm me your email, I'll send the PDF.